Green Schools National Network is excited to partner again with The Center for Green Schools at USGBC to co-present the Best of Green Schools 2019. 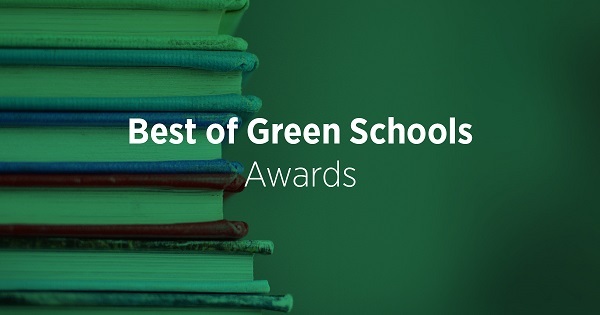 The Best of Green Schools celebrates the hard work being done—by people, schools, campuses and organizations—to push the green schools movement forward. The 2018 honorees included a policymaker instrumental in establishing a grant program to address deteriorating school facilities and a school district that built a classroom entirely out of recycled sea containers. The call for nominations closes at 11:59 p.m. ET on Friday, January 18, 2019. Do you know someone who is making significant strides toward creating more sustainable schools? We want to hear from you! You are welcome to submit nominations for yourself and others. Winners will be announced and awards given at the 2019 Green Schools Conference and Expo, to be held April 8–9 in Saint Paul, Minnesota, in partnership with IMPACT, the Midwest’s leading event for sustainable development. This annual gathering of the leaders and innovators in the green schools movement is the perfect moment to celebrate the leadership embodied by awardees. Don’t forget…register to attend the conference so you’ll be on hand in Saint Paul to see (or receive!) the awards during the ceremony. K-12 School: Recognizing schools that have consistently modeled exemplary green school practices and share what they have learned with external communities. School System: Recognizing school systems and districts that have created long-term partnerships, demonstrated a commitment to systemic change, and shared best practices with external communities. Higher Ed Institution: Recognizing higher education institutions or faculty members who have made a significant contribution to the K-12 green schools movement through partnership, research, and/or scholarship. Policy Maker: Recognizing individuals who have demonstrated exemplary efforts in promoting policies at the local, state, or federal level that support the necessary systemic change to ensure that all children can attend a green school. Student Leader: Recognizing K-12 students who have demonstrated exemplary efforts in promoting improvements to their schools and communities. Transformation: Recognizing investments of time, energy, and resources to transform a school, school community, event, or policy into an exemplary model for the green schools movement. Moment for the Movement: Recognizing events, initiatives, or happenings that significantly advanced the green schools movement.